American Paper Optics, the world's leading manufacturer of paper 3D glasses, also offers a wide variety of durable 3D Plastic Glasses for special venues, theme park attractions, theatrical presentations, multi-media displays, stereo pairs, website, digital theaters, and print viewing. Our Theme Park Style 3D Plastic Glasses have durable flexi-frames and are available with both Linear Polarized lenses (45º/135º) and Circular Polarized lenses. We stock these multi-use washable/reusable glasses in Linear Polarized black frames and Circular Polarized Red frames for immediate shipment. Other colors and frame configurations are available with longer lead times. Aviation Style 3D Plastic Glasses are constructed of high quality hinged (folding) plastic frames available in Black with either Linear Polarized or Circular Polarized lenses. American Paper Optics stocks a large volume of inexpensive Circular Polarized (single use) 3D glasses that are perfect for theatrical use and are compatible at nearly all standard digital theaters. These black plastic glasses have high quality Circular Polarized filters and are designed for fashion and reliability. Our plastic proprietary Anaglyph glasses with our special red/cyan filters are available in 2 special black frame options. 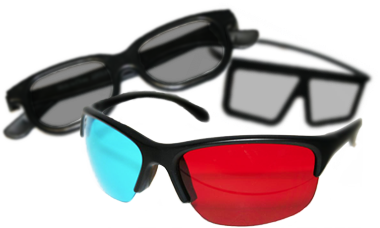 ChromaDepth® 3D Plastic Glasses are available with either Standard (black frame) or High Definition (red frame) lenses. These re-usable theme park style flexi-frames are durable for viewing print, multi-media displays, web sites, black light effects and laser shows.